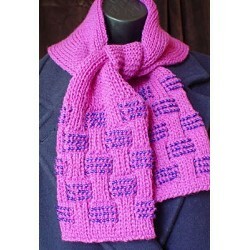 Create a beaded scarf and matching split-cuff anklets with this delectable pattern. Available to make in sizes adult small, medium and large, this pattern calls for 70 [80, 90] yards of DK weight for color A and 185 [215, 255] yards of DK for color B (the remainder of anklets). Use size 2.5/3mm circular or double point needles and size 6 [7, 8] knitting needles for knitting back and forth. Other materials include 240 size 6/0 seed beads (approx 20 g); size 24 tapestry needle; nylon dental floss threader or other collapsing eye needle for stringing beads.